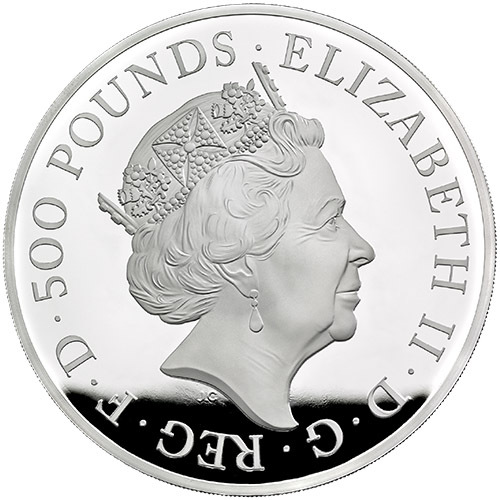 The largest weights available in the Queen’s Beast Series are the 1 kilogram coins from the Royal Mint. This weight is not available in bullion options, but it is featured in the Proof Queen’s Beast Range in both gold and silver coins for sale. Today, 2019 1 Kilo Proof Silver British Queen’s Beast Falcon of the Plantagenets Coins are available to you online at Silver.com. Coins ship to you inside of a beautiful wooden display box and include a Certificate of Authenticity! Fifth coin released in the Proof Queen’s Beast Series! Mintage limited to 100 coins only! The face value of £500 (GBP) is fully backed by Great Britain’s government. The reverse side includes the design of the White Falcon of King Edward III. The House of Plantagenet came to power in England in 1154 when Henry II ascended to the throne. The house arose in the Anjou region of France in the 9th century, and by the time it came to control England its members were monarchs in various countries across the European continent. The Plantagenets were the first major house to control the English crown for a long period of time. During its 331-year reign, the Plantagenets saw 14 different monarchs control England. Among them was Edward III, a 14th century King of England who guided the nation through the Hundred Years’ War. 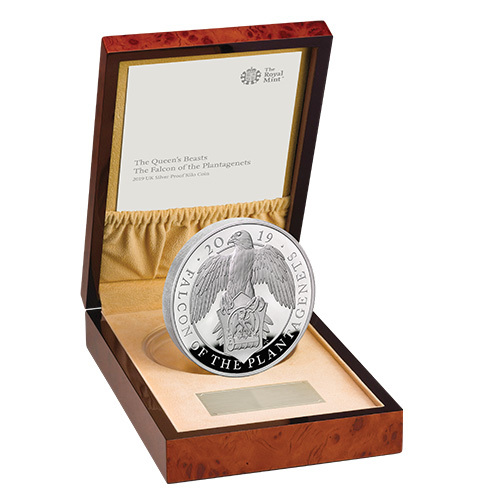 All of the 2019 1 Kilo Proof Silver British Queen’s Beast Falcon of the Plantagenets Coins in this listing are available to you with a unique wooden display box. The box includes a Certificate of Authenticity for the coin and a booklet with further background information on the White Falcon heraldic beast. On the obverse of 2019 Proof Silver British Queen’s Beast Coins is the effigy of Queen Elizabeth II. This effigy of Her Majesty was designed in 2015 by Jody Clark for the Royal Mint and depicts the Queen in right-profile relief. The reverse side of 2019 1 Kilo Proof Silver British Queen’s Beast Coins includes the White Falcon of Edward III. The design includes two falcons. One supports the shield while the other is featured on the shield holding an open fetterlock. Please feel free to reach out to Silver.com with your questions. You can call our customer service team on the phone at 888-989-7223, chat with us live online via our live service, or simply send us an email with your inquiries. You’ll also find live silver prices updated throughout the day on our website.